The Ballettakademie is run by Mr. Vogl who is a nationally certified and internationally recognized ballet pedagogue, choreographer and former master class student of Prof. Gustav Blank. The academy’s teachings are in accordance to the style and method of the former Russian ballerina and pedagogue Yewgenia Eduardowa. After the Russian Revolution in 1917she left St. Petersburg where she was a celebrated ballerina with the Mariinsky Ballet and moved to Berlin where she founded her own ballet school. Due to Mr. Vogl’s commitment and dedication of hiring excellent and well-educated teachers, his school soon became very popular in Berlin and abroad. Since then his school has brought forth a number of great dancers, teachers and even artistic directors. Any feeling, any situation, and any music can be expressed in dance. Whether it be a professional or an amateur, old or young, girl or boy – in dance everybody gets a chance to express and free themselves. Dance encompasses the entire individual – body, mind and soul – and helps to find inner balance. It is our great concern to kindle the love, passion and enthusiasm for dance, especially in children and teenagers. Dance does not only promote strength, flexibility, balance and suppleness, but also furthers discipline, ambition and perseverance. Furthermore, dance helps to grow in confidence and adds to a healthy and positive development of personality. Therefore, we attach importance to excellent teachers who not only show their students the joy of dancing, but also support them with their creative development and help them reach their own individual goals. With the foundation of the „Ballettakademie Hans Vogl Berlin“ in 1976, a long-felt wish was fulfilled. 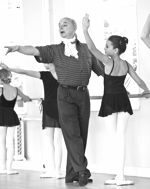 Thanks to his own ballet education, his vast experience on numerous famous stages, and the high standards of only having top-notch teachers at his academy, he quickly established himself as a first class internationally renowned ballet pedagogue.